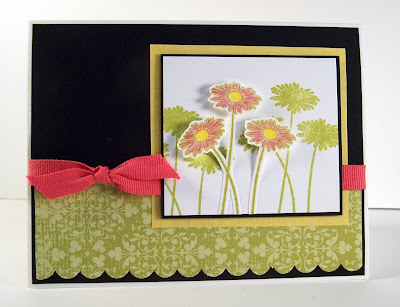 Today I'd like to share a Pull Treat Card that I made for the challenge on Paper Craft Planet. 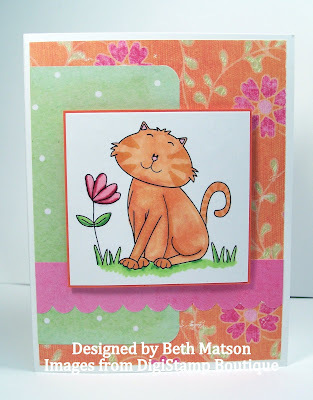 Fellow Clear and Simple Stamps design team member Lori posted a challenge to create a Pull Treat Card. So here is my first attempt. I ran to the store and bought a king size Mr Goodbar and made a cover for it. Here's a photo of the candy bar inside the wrapper. If you pull on the ribbons the candy bar slides out of the wrapper. The directions for the wrapper can be found here. I hope you'll join us for the challenge. Calling all stampers with style! design team call – all can apply. Do you love Clear and Simple Stamps line of stamps? Then you should consider applying for their design team. More details can be found here. It's a great company to work for! The inspiration challenge on Saturday for Splitcoast Stampers was to use this photo from Country Living as the inspiration for your creation. So I pulled out some papers from K&Co and got to work. I went with a nice bold floral like the wallpaper and some striped paper inspired by the curtains. For the focal image I used some Marigold Morning as inspired by the lovely velvet chair at the desk. For the finishing touch I added some crystals because of the crystal chandelier in the photo. The stamps are from the newly released Gratitude set from Clear and Simple Stamps. Details on the Inspiration Challenge can be found here. 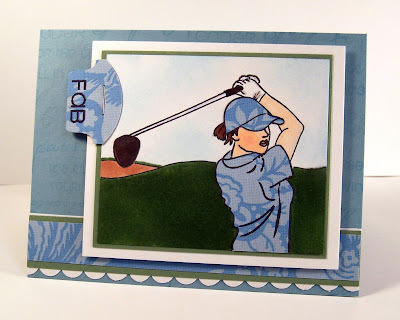 Another set released from Clear & Simple Stamps this month is Foursome. Here are a couple of samples using this wonderful set. 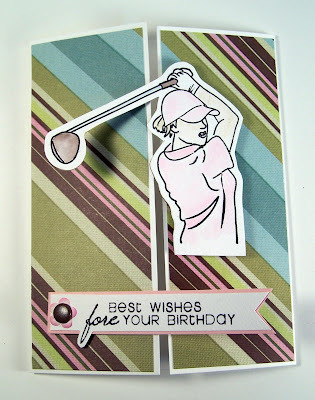 A nice long golf card. 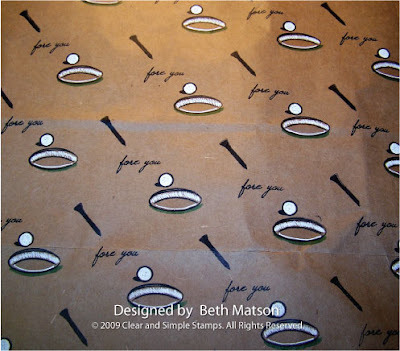 And some handmade gift wrap made from a brown paper grocery bag. I just stamped the images with black ink and added some accents with a white gel pen. 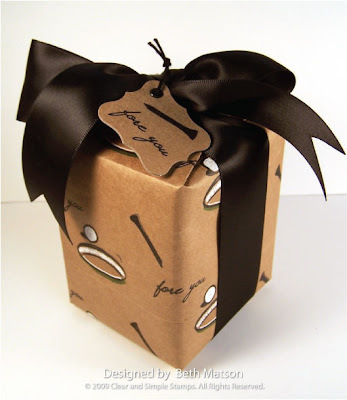 Wrap your gift, add a nice ribbon and a tag and you're done. What a great way to dress up any package! Thanks so much for stopping. I hope you have a wonderful day. Thanks so much for stopping. I hope you all have a wonderful day! 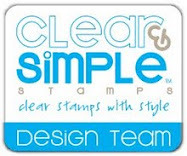 It's release day today for Clear and Simple Stamps. Do you have any golfers in your life? Well then you're going to love the new sets being released by Clear & Simple Stamps tomorrow (May 15th). Let me present Golf Darling. Where have I been . . .
No, not on a fabulous vacation. Just buried in paperwork, and budgets, and busy planning banquets. Ugh! Hopefully the rush is over now and things will start to calm down again so I can get back to my crafting and blogging because this Friday (May 15th) is another release for Clear & Simple Stamps and I have lots of projects to share with you. One of the new sets that will be released on Friday is Gratitude. Here's a sneak peak of the set. This is a really fun set to work with. I love that it has both the silhouette stamp of the flowers and the line detail stamp. 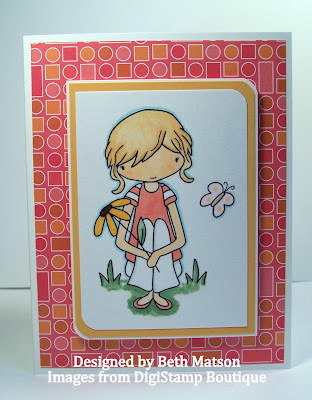 For today's card I used both of the flower stamps. I stamped the line detail flowers in Kiwi Kiss on white cardstock and cut them out. Then I stamped the silhouette flowers on a white block in Kiwi Kiss. After I colored the cut out flowers I mounted them to the white block with pop dots and matted the piece with black and yellow. The card base is white with a mat of black. 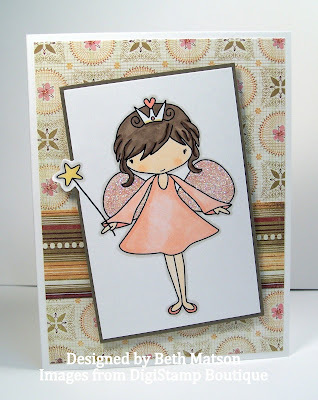 On the bottom half of the card is some patterned paper with a scalloped edge. For the finishing touch I tied a ribbon and bow around the card. For more sneak peaks, check out the other design team members blogs (they're linked in my sidebar) and the Clear & Simple Stamps company blog. Thank you so much for stopping by. I hope you're all having a wonderful week. Are you ready for the May Take The Challenge Tuesday? Please be sure to visit the other design team member's blogs for more challenge cards. Thanks so much for stopping by. I hope you're all having a great day!